Given the entire purpose of packaging, the idea of “zero waste” may seem counter-intuitive. How can you package anything without inevitably causing some leftover waste? Turns out, zero waste packaging is being hotly discussed in the manufacturing space, with many companies committing to reducing or eliminating waste — and many consumers actively seeking these options. To break it down, zero waste packaging takes things one step further than sustainable packaging. If this is new to you, read on to learn all about this trend, what it involves, and how it could affect your operations. What Is Zero Waste Packaging? Zero waste packaging essentially refers to a system of packaging where all materials are utilized, reused, or recycled, so there’s no waste product. While any type of packaging is going to involve some kind of leftover component, there are innovative ways to make the process of packaging into a zero waste endeavor. Are you using packaging that makes the most sense for your business? Download our Packaging Design Process Cheat Sheet! According to the Zero Waste International Alliance: "Zero Waste means designing and managing products and processes to systematically avoid and eliminate the volume and toxicity of waste and materials, conserve and recover all resources, and not burn or bury them. Implementing Zero Waste will eliminate all discharges to land, water or air that are a threat to planetary, human, animal or plant health." Innovators are trying different things to achieve zero waste, from creating packaging that serves its own separate purpose (such as “plantable packaging”), to designing edible containers or nontoxic “films” that can protect items without any excess material. In this post we’ll explore some of the details of zero waste packaging and how it’s significant for the manufacturing space. Aiming for zero waste packaging — or packaging that’s as minimal, efficient, and sustainable as possible, is good for the people, the planet, and can benefit your company’s bottom line. Why Is Zero Waste Packaging on the Horizon? As the global population grows, so does the waste we all contribute to producing. There’s somewhere around 6.9 billion tons of plastic waste on the planet. Conscious companies, leaders, and consumers don’t want to see that number continue to grow — so there’s a lot of discussion of alternative options that are more sustainable. And it’s not just plastic. Landfills continue to swell in size with all kinds of materials; even items that are biodegradable can take decades or longer to break down. The bottom line is, the more sustainable and zero waste options, the better for everyone who shares the planet. Utilizing the most of your packaging of any sort without creating waste in the production process is hugely beneficial to the zero-waste cause. While it’s great to use recycled products (and recyclable materials) — it isn’t a foolproof solution, and it can’t address all of the waste that’s created. Research has found that despite widespread adoption by consumers, recycling has not been fully successful. This is mainly due to confusion and as a consequence, contaminated recycling streams that aren’t efficient or effective. In the U.S., most recycling is “single stream,” meaning there’s one bin for paper, plastic, metal and glass. Unfortunately, this has led to large-scale confusion among consumers, who aren’t sure what is recyclable and what isn’t. Recycling codes are different in different locations, and some products are made with a combination of materials, making it even more complicated. And, when recycling streams become contaminated with the wrong items, much of the material ends up in landfills. All of this means that it’s more important than ever to find alternatives to recycling. Zero waste packaging can be a challenge. Not only does it require re-thinking what materials are used, but it often involves a full-circle process, where your materials come back to you for reuse or repurposing. Essentially, zero waste is about companies taking control of the waste their operations creates, which means setting up a system for what happens to the waste/containment after it’s in the hands of consumers or buyers — not necessarily an easy task. But despite the obstacles, zero waste is a great goal for conscious companies who are looking to make a positive impact in the world, and it can also save money — when done the right way. It can also help your business build brand loyalty with consumers who are looking for greener options. Zero Waste in Action: How Does It Work? While zero waste differs from industry to industry, the overall goal is the same — eliminate waste and transform or reuse all materials. When done properly, zero waste can lead to cost savings. If your company creates a closed loop where packaging materials are being reused — or transformed into another revenue source — it saves on the initial cost of creating an endless amount of single-use containers. Consider this example: your product is packaged in a sturdy, reusable container. When a consumer is finished with the product, they return the package via a local drop-off point or through a shipping service. Then, your company cleans and prepares the container to be refilled. That’s the idea behind Loop, a zero waste packaging network created by a group of large consumer brands that’s slated to launch later this year. Initially, products will be available through Loop’s e-commerce site, and consumers will pay a deposit for the bottle that their product contains. Products could be as diverse as ice cream, deodorant, toothpaste, etc. The products will be delivered in a reusable tote. As the items are used up, the consumer will put the containers back into the tote and set it aside. When the tote is full, they can request that a driver pick it up or drop it off at the UPS store. The used packaging will then be cleaned, sterilized, and refilled. Each container is designed for 100 or more uses. This is a large-scale example of brands working together, but it explains how zero waste can be made possible. Offer consumers incentives for returning or reusing their packaging materials. Think of ways your packaging could be upcycled or turned into another revenue stream. Minimize the amount of packaging you utilize per package by reducing film widths, thus reducing film waste. 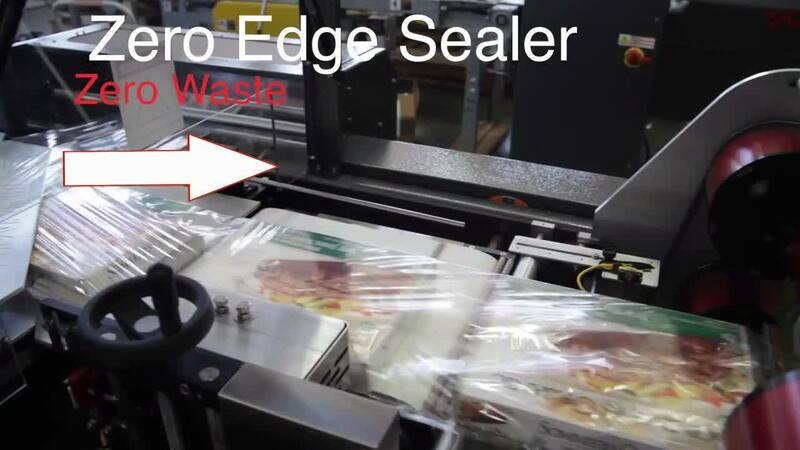 Invest in packaging machinery that is geared towards zero waste, like the zero-edge sealer from our one of our partners, Extreme packaging. What Are the Issues With Zero Waste Packaging? As we’ve established, aiming for zero waste packaging isn’t necessarily an easy process — particularly depending on what your product is. Consumer behavior. If the process is too time-consuming or confusing, consumers may not comply with the instructions. They may not have time to drop their packaging off somewhere, or could simply forget. Ease of use for consumers is a key requirement for making zero waste packaging a reality. The widespread adoption of zero waste packaging is still far in the future. But knowing about this trend — and how it could potentially benefit your company and clients — is key as the industry moves towards more sustainable options. In the meantime, if you’re looking to reduce the use of packaging materials or move towards more sustainable and efficient materials and processes, consider a packaging audit. It can help you assess where you stand — and what your company’s future could look like. If you’re interested in optimizing your packaging, start by downloading our Ultimate Guide to Protective Packaging!